One of the most common questions that I get about guided reading groups, is how do you manage the other kids while you are working with a group? Then, I say "centers" and they say "Well, duh! But how???" I must say that I used to DESPISE center time. And it was for all of the same reasons as you. It was so much to manage. So much to organize. 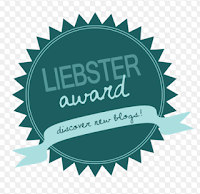 What about the kids that are not independent learners yet? How do you get them to actually DO the centers and not just goof around the entire time? What about accountability? We'll today I have some answers for you! Now, this is not a fool proof answer. You are still going to have those "moments." Those moments when you want to pull your hair out and just give up because nothing is going well. You will still have that kid...you know the one. The one that refuses to do anything you say merely because he can. That kid that looks directly at you while simultaneously dumping out all of your so neatly organized center tubs. Yes, it is inevitable. It will happen. But my goal today is to merely give you some ideas for making these moments fewer and further between. The first step to centers is organizing a schedule. 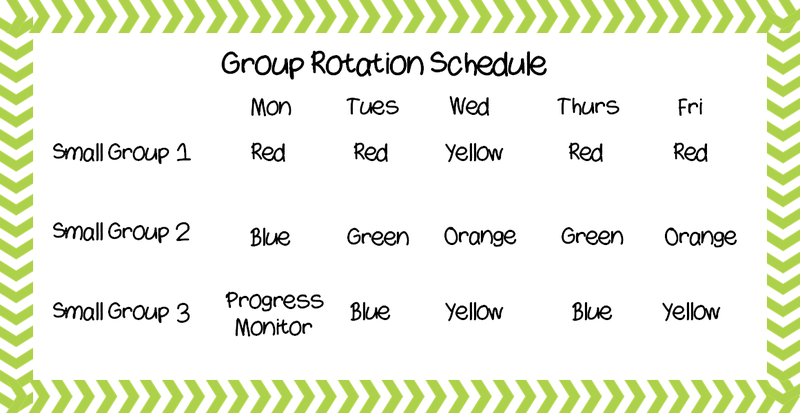 This is a two part step: rotation schedule and group schedule. 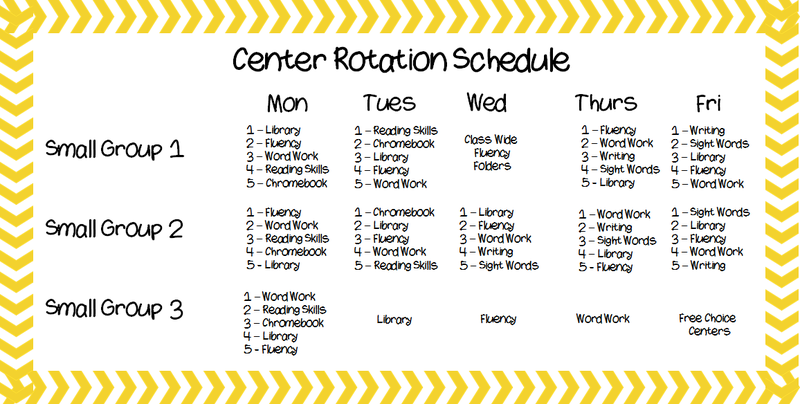 For rotation schedules, I used to have students rotate with the kids in their reading group. So what happened? My highest kids were bored, finished early, and then began loud conversations. My lowest kids had no idea how to complete the task and ended up playing in the materials or having wrestling matches on the floor. This was not working. This year, I went with heterogeneous groups. 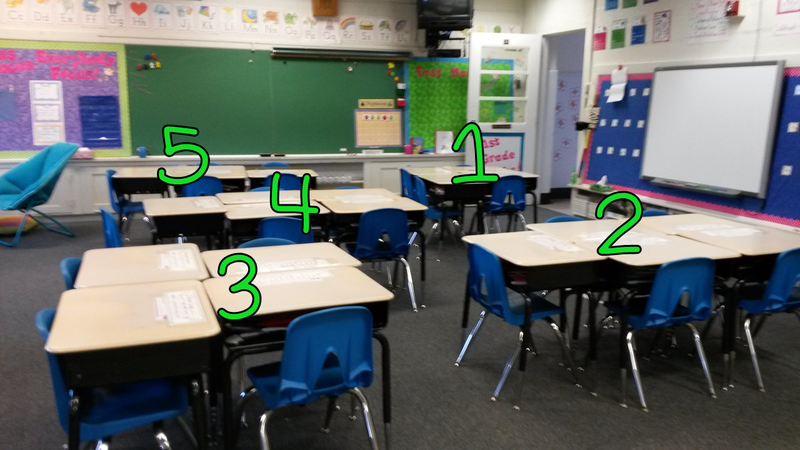 I have my students sitting in groups throughout the day anyway, so when arranging desks I take into consideration the levels of my students as well as how they get along. This becomes their center group. They work with this group during each center and then I pull students to my table from there. So each group, or "table" as I call them, may have one member coming to my table for instruction at any given time. You can see in this picture my table groupings. This is an older picture. There are now signs above each group saying what table number they are. 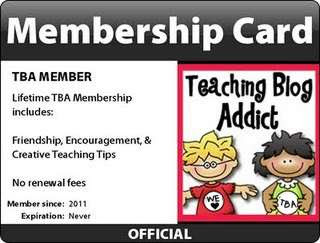 They work with these groups for center time and then I pull the kids that I need for my small group! How does this help? Now I have a mix of levels that can help one another with the task. My higher students can explain how to do the center or remind students of what to do, if necessary. They work so much better together this way. It is by far one of the BEST things I have ever done with my groups! You can see that the numbers represent my tables (Table 1, Table 2, etc). In the afternoons, several students are pulled for reading remediation. Therefore, I do not have as many students in my class for that third small group time. This means that I only do one center during that time, since there is a much smaller group. The second part is setting up your actual schedule for center time. 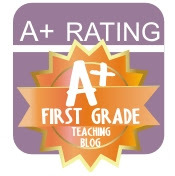 For this, I used to have students go from one center to the next center to the next. You know what happened? About halfway through the second set of centers, my kids lost focus. They were no longer interested. They were tired. They stopped working and started playing. So how to fix it? This year I began breaking up my whole group reading lesson into chunks. We are required to do Superkids at my school (this is our basal reading program). So rather than doing an hour of Superkids and then an hour of centers/groups, I started alternating. I now do about 30 minutes of Superkids, followed by a center/group. Then I do 20-30 more minutes of Superkids followed by another center/group. Then we have our lunch break and come back for my last center/group time. 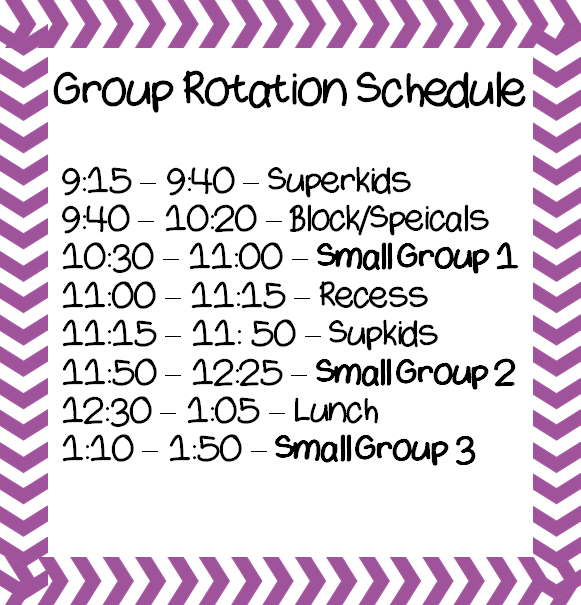 If I didn't already have that lunch break built in, I would put a group before Superkids instead (group, Superkids, group, Superkids, group). How does this help? It gives students a break. Students cannot focus on instruction for an hour at a time. They need breaks in between so they don't lose that focus. This helps because after one center, I can pull them back together with me to do an activity before sending them out to centers again. This also means that I can go over the rules/expectations again before each center if necessary. It helps students to refocus each time! Here is my weekly schedule so that you can see how many groups I have and how many times I meet with each group. Each group has a different color for its name and I spend Monday afternoons progress monitoring and assessing. Doing these two things will make a huge difference in your guided reading time. If you don't take anything else way from this guided reading series, it should be that! Other organizational tips have to do with the center materials themselves. Those will come in next week's post for part 2! 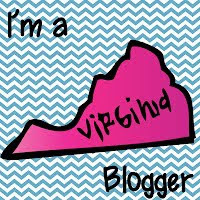 Guided Reading Series: My Toolkit, What's inside?